When i was wondering why I was spending time working on these books (when there was amble other things I could be addressing) my very wise daughter responded, without hesitation - you need a creative outlet!! from the mouth of babes!! So that my contribution to the Illustration Friday community!! 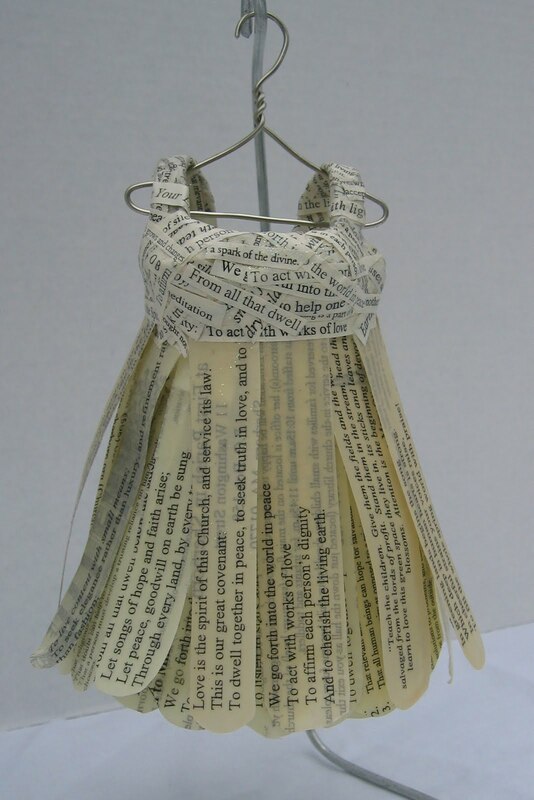 a illustration of an obsession which also represents my obsession with making art and my obsession with dresses!!! Which leads me to the other photo in this post - the dress I made with Eugene Quinn for the Barefoot at Rockport event which was held yesterday!! It was a beautiful event and I was so honored to be included!! Thank you Corina Belle-Isle who organized all the magic!! Happy Friday!! Baggage is what we carry when we travel and what we bring to relationships. Baggage contains our belongings and our emotions. It gets dragged, lugged, carried and shipped from place to place. It can take many shapes and hold many things. Lastly, but not leastly, I am doing a collaborative piece with artist Eugene J. Quinn for Barefoot at Rockport, a celebration of art and fashion Thursday July 28th. The event sounds so fantastic ~ On July 28th, Art comes alive in a fashion event on Boston’s north shore. Barefoot at Rockport is a day long celebration of fashion as art, a showcase for independent local and national designers, and boutiques. It’s a day of shopping, wine tasting, a showcase for our artisan food designers, mixologists, stylists, floral designers, it’s a fashion exhibit at one of New England’s most notable art associations, the Rockport Art Association and a fashion extravaganza and exclusive cocktail party all set against the back drop of the jewel of Boston’s north shore, Rockport MA and in one of New England’s premiere performance centers, the Shalin Liu. More to come about the Rockport dress and this packed-full event, but right now i need to pack her up and head North. "every moment is a golden one for him who has the vision to recognize it as such"
& for the dress I turned to one of my favorite resources ~ the order of service from the Unitarian Universalist Area Church, Sherborn. 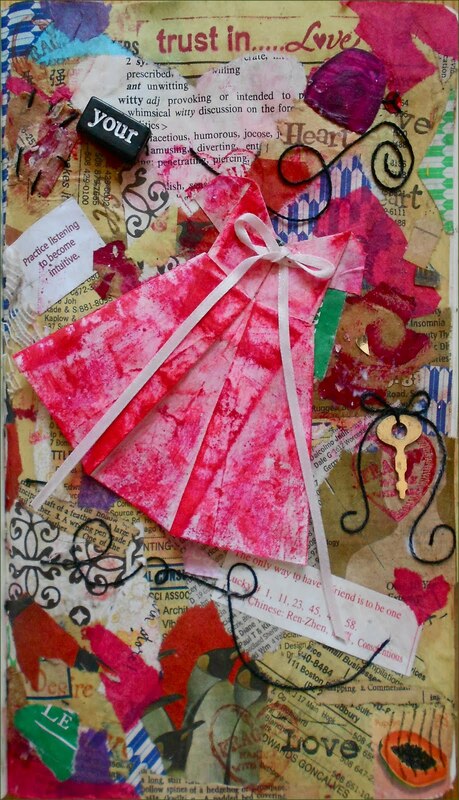 The dress "a spark of the divine" came from these pages ~ it is full of positive affirmations and poetry, and it is on a beautiful colored paper!! And to cherish the living earth"
David epitomizes this sentiment so it seemed a fitting choice. And this birthday boy is in the midst of that wonderful frenzy of getting ready for a show at the Boston Sculptor's Gallery in a few weeks. To keep up with this bundle of energy check out his blog or his facebook artist's page & enjoy the wonder which is David Lang's art!! 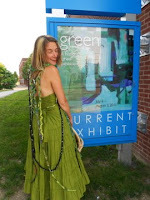 It was a fabulous evening at the opening reception for Attleboro Arts Museum's exhibition, Green. I had such a wonderful time 'performing' with my piece, 'insatiable'. Many people helped me work. A girl named Gabby was very intrigued with the piece ~ wondering if I was going to be working on the piece the entire time the show was open!? She was disappointed when I told her that I would only be crocheting during certain scheduled times, but then she learned how to crochet and helped me work on the piece. She also did decide to give 'insatiable' another name, she called it Bob. The museum staff had created a terrific set-up for me and 'insatiable' ~ I had an entire corner to myself. 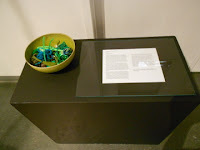 There was also a bowl where people could leave materials for me to crochet into the piece. 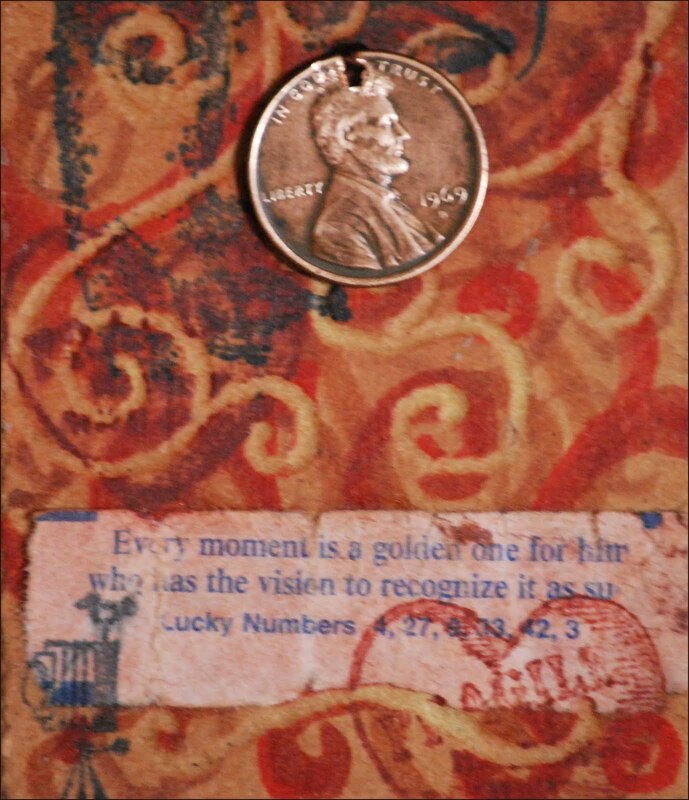 When I got there there was a buckle in the bowl that I immediately worked into the piece. For me this evening was extra exciting because I was 'to perform' with my piece during the reception!!! 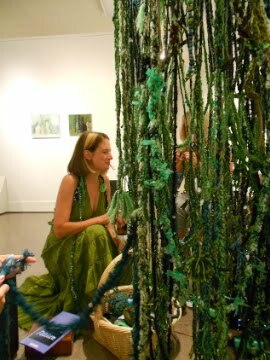 With this in mind, I felt I should 'look' the part, so I went all out ~ I wore a green dress, had green fingernails and toenails, green tinsel in my hair and made myself a kind of crocheted shawl, which I loved wearing. And the experience was awesome!!! I LOVED!!! working on 'insatiable' again. In fact it was so wonderful that I have started another giant creature to work on at home. 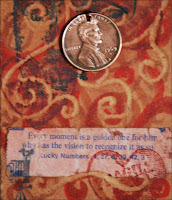 This time it is red; and I want to make it so people will be able to go inside the piece. That is something I see people wanting to do with 'insatiable' ~ to get inside, however there is no easy and safe way to get it. It is amazing to me to see how people are drawn to 'insatiable'. I encourage them to touch and play with the piece. Many artists and curators discourage any touching of art because the oils from hands can cause the work to decay. But as I have mentioned before ~ I see my creatures as alive and especially 'insatiable' ~ changing all the time. So the idea that 'insatiable' will be touched, meaning that there is the possibility of it getting a little dirty or oily, only adds to its ever evolving state. The entire show is a treat for the senses. there are some amazing pieces from all over the country. Below is a list of all the contributing artists, with the award winners in bold :). ( I also put links to their websites and take a look if you have time - so really cool work!!!) And it is SO great to be in another show with my soul sister artist friend, Lisa Barthelson!!! Just another perk about this show!!! So if you are in the area - STOP BY. I will be working on the 'insatiable' at certain times during the exhibit and I will try and post the times here!! Michelle Acuff, Jenny E. Balisle, Stephen Barnwell, Jeanne Barry, Lisa A. Barthelson, David Lee Black, Peter Campbell, Mia Capodilupo, Donna Catanzaro, Barbara Clark, Barry Close, Iris Falck Donnelly, Virginia Fitzgerald, Ricky Gagnon, Eleanor Gilpatrick, Julie Gray, Michael S. Guertin, Leslie Hirst, Kevin Hughes, Bonnie Jaffe, Sharon Loper, Petra Nimtz, Elaine Pawlowicz, Norman Petersen, Lahary Pittman, Barbara Poole, Nikki Rosato, Lisa Gabrielle Russell, Cheryl Safren, Ruth Scotch, Hiroko Shikashio, Alan Strassman, Mark Taber, Stephanie Terelak, Tom Wagner, Elizabeth White, Peggy Wyman, Stephenie A. Zentara. that was also a lot of 'press' :) and I think I made an interesting subject. Below you will find a link to one article about the opening. Attleboro Arts Museum, 86 Park St., Attleboro. Tues. through Sat. 10 a.m. to 5 p.m. This entry is way overdue, yet very timely. 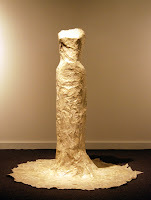 This post is about one of my favorite fiber pieces, 'insatiable'. I have mentioned this piece a few times, always planning to write a longer blurb later, however that hasn't happened, as of yet. But today that will all stop!!! the Attleboro Arts Museum. click here to link to press release. I am so honored to be a part of this national show and, here is a first for me, I will be receiving one of the six juror's awards!!! The guest juror was Kate McNamara, Director and Chief Curator of the Boston University Art Gallery, and from what I saw when I dropped off 'insatiable,' it looks like she put together a great show!! The show will run from July 6th - August 3rd; opening reception and award ceremony July 6th from 7-9 pm, with live music by Cactus Attack. with me and add to the piece. We would sit together crocheting and have wonderful conversations. I also LOVED teaching people how to crochet, 'Virginia style'. I feel as though I am part of a tradition, passing on this treasured passion, since I was taught by fiber artist, Mandy Greer. During my visit to Portland, OR a few years ago, I went to one of Mandy's crochet-a-thon where many gathered to crochet for Mandy's piece “Mater Matrix Mother and Medium”. During the event Mandy taught us novices her style of crocheting and hence, my creatures were born!! Another intriguing element of 'insatiable' is the materials that i have used. i started with a variety of yarns but soon felt the need to use less traditional crocheting materials, such as gardening twine and gimp. Then I found myself using discarded materials, such as broken headphones, ripped plastic bags and old balloon ribbons with the popped balloon. People can also bring in materials for me to crochet into the piece. At the Brandeis show, during one of my performances a woman brought in her dog and gave him a trim and I crocheted his fur into the piece. 'insatiable' has many elements that gives it intrigue. I have collected so much materials that I know that this creature will be growing for awhile. The last really exciting aspect of 'insatiable' is that I see all my creatures as very organic, almost living. So when my creatures are exhibited I tell the curators to display the creatures however they feel is best for that show, since my creatures can hang on the wall, sit on the floor, perch in a corner like a web, to name a few options. So far all the curators are eager to play. So I can't wait to see how 'insatiable' will be tomorrow. ‘insatiable’ belongs to a body of work which I call ‘creatures’. 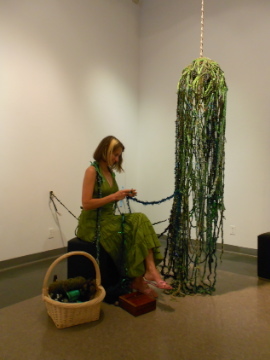 In the spring of 2009 I was introduced to crocheting by fiber/ installation artist, Mandy Greer. Then at the end of 2009 I had an accident in which injured my hands and I was not able to do my usual studio work. However, I was able to crochet, and this is when the creature series really began. I call them creatures because each piece has its own personality. Each creature is created in an intuitive process. Each creature defines itself ~ I work in an organic way, adding different yarns and beads as the piece demands. Then each creature is finished when it feels that it has reached its critical mass. ‘insatiable’ is a great example of how the creatures work. I started this creature with the idea that it would be a regularly sized creature, however I was soon aware that this piece had other plans. 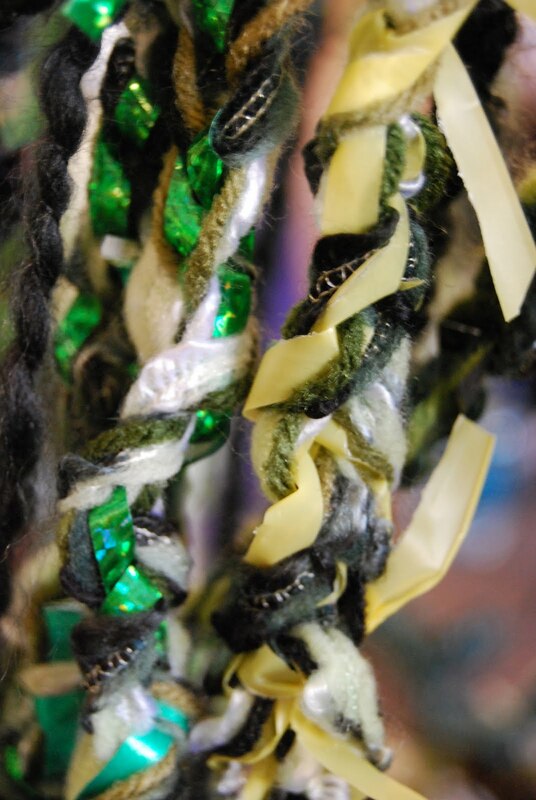 I started ‘insatiable’ with different green yarns but soon I felt the need to expand my ‘materials’. I started adding more non-traditional materials; garden twine, old balloon ribbons (and the balloons), old electrical cords and broken headphones to name a few. I have cut plastic campaign signs, plastic shopping bags and trash bags into thin strips and crochet the strips into the piece. As the piece continued to grow and take in more and more materials, ‘insatiable’ became a performance piece. It was clear that this piece/creature was insatiable, never satisfied, always wanting more. When it is shown, if the gallery wants, I come in at scheduled times and ‘feed the beast’ or in other words, crochet more materials onto the piece. 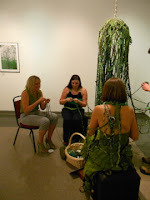 During the performances people can bring in any twine-like material in greens or browns and I will add it in. During one show a women brought in her dog and gave him a trim and then gave me the trimming to add to the piece. Also during my performance I will teach anyone who wants how to crochet and they can add their own handiwork to the piece. The performance element of the work has been very excited ~ besides getting many people evolved an artistic process, I have created a situation evocative of quieter times, when community was formed when women gathered to do their needlework. During my performances the participants quiet from the craziness on their high tech, electronic worlds. They engage with each other and appear to find some solace. 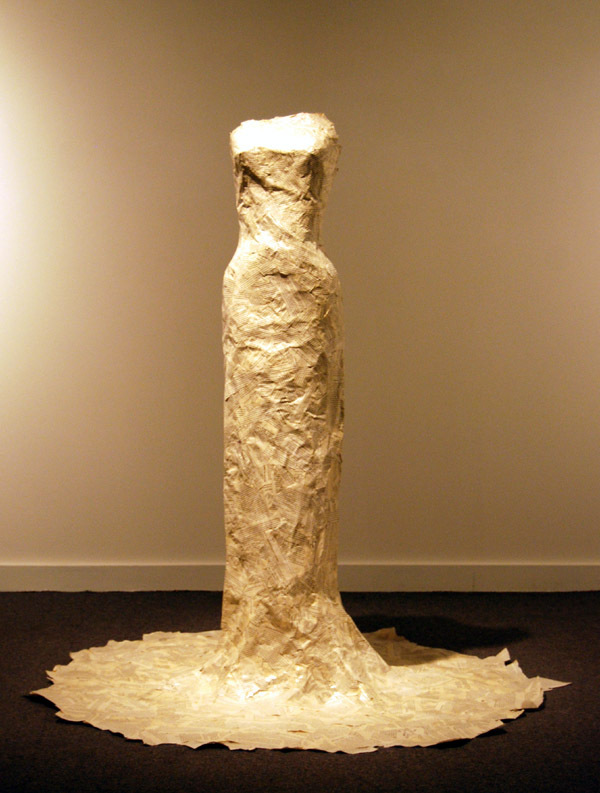 ‘insatiable’ speaks to the idea of ‘recycling’ by taking the many materials that people have dismissed or discarded and reusing and incorporating them into the piece. There is a parallel between ‘insatiable’ and a tree. 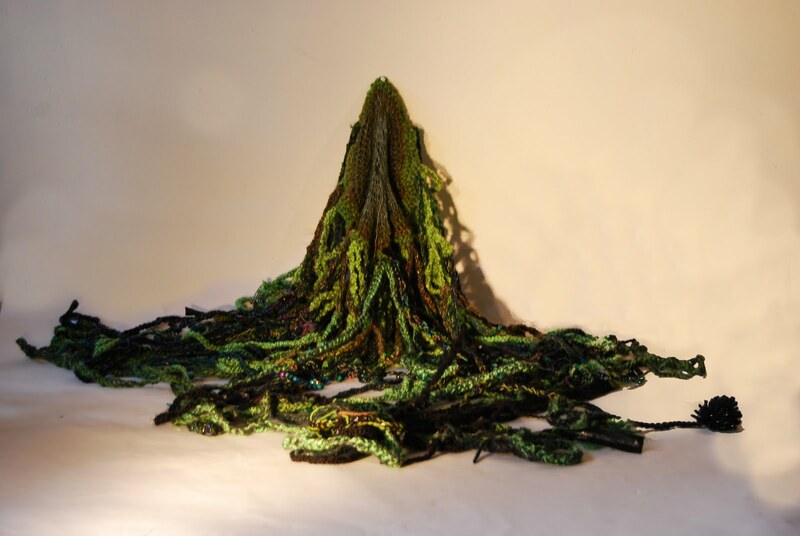 Besides the visual similarity, ‘insatiable’ takes what is discarded and turns it into something beautiful and new, such as a tree takes carbon dioxide and turns it into much needed oxygen. ‘insatiable’ can be exhibited in many different ways ~ it can sit on the floor, on a wall, in a corner or hang from the ceiling. The possibilities are endless. Thank you and peace. 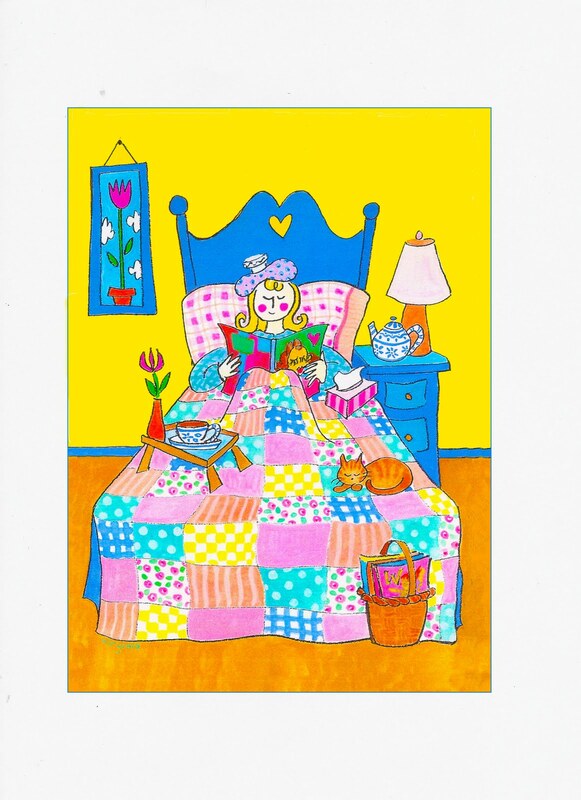 This week's illustration friday's prompt is 'remedy'. For this week i reached back to one of my greeting card illustrations, an illustration for a get well card!! I think the remedy for most anything is a little TLC!! All content of this blog is the property of Virginia Fitzgerald and is protected by copyright law (c) 2006-2013, unless otherwise stated. All rights reserved. The Hyperbolic Crochet Coral Reef Travels and other interesting sites. Today is International Women's Day!! for your sunday pleasure .... Sale! on both Society6 and Redbubble!!! virginia fitzgerald. Simple theme. Powered by Blogger.